Why should you incorporate soy proteins in your child’s diet? I have been talking about my weight loss journey, my experience of incorporating soy proteins in my diet and eating healthy, since the last few months. 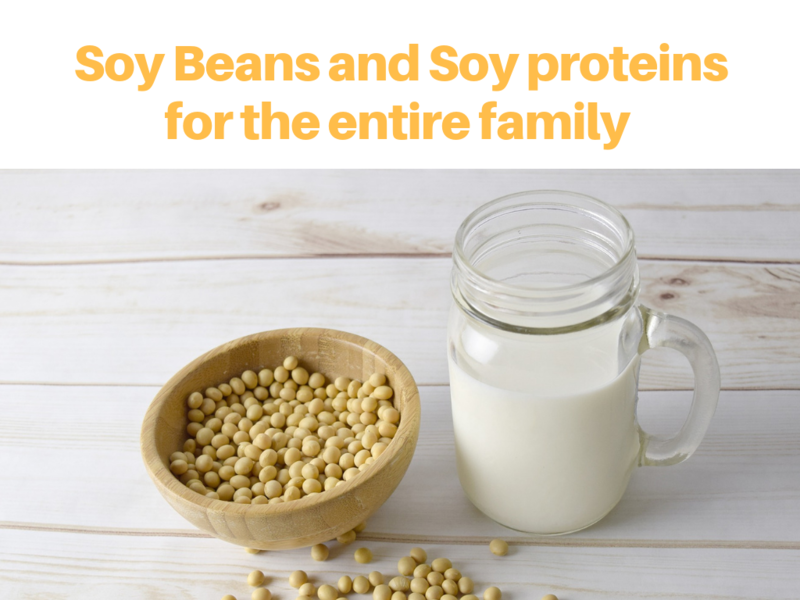 In this post, I am going to talk about the importance of soy proteins for children. I live in a joint family of 18 members and our youngest family member is 4 years old and the oldest is 68 years old. We all have a varied diet and different tastes. One important ingredient in all our diets is soy. For the younger kids in the house, my mom tries to cook protein-rich meals for their overall growth. The Institute of medicines says that children up to the age of 13 require at least 34 grams of protein. Teenage girls (14 to 18 years old) require 46 grams of proteins. Whereas teenage boys (14 to 18 years) require 52 grams of protein. If the children are vegetarian, eggs, which are considered to be a good source of protein, cannot be incorporated into their diets. Soybeans contain no cholesterol and very low saturated fats. Soybean contains all the right amino acids that are essential for our body and are a good source of iron, Vitamin B, fibre and calcium. This makes soybeans very important for a child’s growth. Being bland in taste, it is easy to incorporate soy and soy proteins in many recipes. My mother makes silken tofu bhurji, pancakes with soy protein powder and soybean manchurian to ensure all the kids in the house enjoy their meals and have all the health benefits of soy proteins. What do experts have to say about soy proteins for children? We spoke to Kejal Sheth, Nutritionist, Weight Management and Founder of Nutrivity.in on the benefits of soy proteins for children. This is what she had to say “Soy is a rich source of protein which means that like meat it has all the amino acids our body needs to be abundant in proteins. Some soy foods like edamame are filled with iron and fibre. Soy foods are very nutritious while adding great variety to your child’s diet. Churn up protein-rich smoothies with tofu, soy milk and a variety of fruits. Give your child a healthy mix of trail by using honey roasted soy nuts and chocolate covered soy nuts with whole grain cereal, dried fruits and raisins. Add fortified soy milk containing calcium, vitamin A, vitamin D, and high-quality protein to the diets of children who do not drink cow’s milk. It has almost 50 fewer calories than whole milk per serving. In place of peanut butter, spread soy nut butter on whole wheat bread. Serve soy nuggets in place of chicken nuggets as they save a lot of calories. On the grill, make soy burgers instead of regular hamburgers to add fibre and reduce calories. I hope you enjoyed reading this post on the importance of soy proteins for children and the tips shared by nutritionist Kejal Sheth. There is a lot more to learn about soy. These are eight important benefits of soy that I share from my journey with this wonder protein. You can add soy and soy proteins to your diet in fascinating ways. Do let me know how you use soy proteins for children in your house. Since soybeans are so high in protein, they’re a winner in that regard. The ideas you give for using them in recipes should make them a more popular choice. This is really a great blog. soy proteins is really good for our kids because of it’s many health benefits. Both of my sons drank soy milk when they were babies because they couldn’t tolerate milk-based formula. They fared much better after the change. I need to do this more with my niece & nephew. I have a Vitamix so whenever I have them I sneak all sorts of things into their smoothies & they have no idea… its the best! I never knew that soy had so many health benefits. I had always heard that too much of it was bad, especially for women. As someone who is trying to eat less meat, some of your suggestions for substitutions sound rally good. Thanks for sharing all of this helpful info! I need to add more soy proteins into my own diet as well. Soy is a great thing to add into your diet, but I have also heard that it affects estrogens in the body especially for children. We are vegetarian and we do eat a lot of soy, from burgers to other fake meats, and regular tofu. I didn’t know that there were so many options with soy! I’ve been looking to add some meatless meals to your dinner plans so this is very interesting! Thanks so much! I know there are a lot of soy ingredient traces in many products we eat, Yet when going to the store I don’t usually search for soy products (that are the main ingredient)… I will have to change things up a bit and venture into the soy proteins for my kiddos! My daughter has been eating solids for 6 months. Have never tried soy before, I may consider it. I had honestly never thought about incorporating soybeans into my child’s diet. This sounds like a great thing to potentially start adding! such a useful information! soy proteins is really good for our health too and it is vegetarian. Such an informative post! As an adult, I too use soy protein in my diet often. Glad that you’ve mentioned all its health benefits! My family don’t like soy flavor much. I would love to try out your healthy recipe ideas though. The benefits are amazing and will try to include more soy products. Interesting post. We like to incorporate lots of variety into our family meals, so love to use soya, Quorn and tofu alongside meatier days. Such an informative post, I will have to incorporate some soy proteins into our daily diets. I think soy beans are great! They are so packed in protein and make for great meatless options! This is great information that you have shared. I never knew that soy protein was so valuable and important. Very informative post! Ive never been into the soy and I think the really only way it was ever in our home was soy formula when my daughter was younger. I think it would be neat to give it a try and also see what my kids think. Thanks for the inspiration. I love soy and soy products. I always make sure to buy organic to avoid GMO’s. I love soybeans and love how much protein they provide! I always have a bag of frozen edamame in my freezer. I’m a vegetarian and my kids are, too. Soy proteins are a big part of our nutrition! I think I need to incorporate this into our diets. I have 3 children one who is almost a teenager so this would be a very important thing to add. Soy is really important for everyone’s health. It has lots of proteins. As a vegetable diet it is much more beneficial for children and others too. Thank you for your beautiful and informative post. We could get a lot of benefits when eating Soy. And the idea of adding them in the recipe is a great thing to do. I had no idea that soy has so high in protein. It does make sense to introduce it into children’s diets in this case. I have to admit im not a fan of anything soy but after reading this Im definitely thinking twice about it & for my kids. Alas, some of the soy in markets are GMO so one has to be careful of that. There’s also the fact that too much of it isn’t good for women. It naturally contains phyto-estrogens bu the GMO versions might have too much of it. I have heard a mixed bag about soy proteins. But always good to learn more.about the subject. I will have to consider it. Kids generally don’t like soy but this is one amazing recipe to give them all the nutritional goodness of soy. I am going to try it out for my nieces and nephews. Thanks for the post. Good to know! I’ll probably start doing this! Unfortunately soy is not a thing in our household due to allergies!